Two months ago, Incrementum Liechtenstein released its chartbook entitled “Monetary Tectonics” which illustrated the raging war between inflation and deflation in 40 charts. Meantime, the authors of the chartbook have launched the “Austrian Economics Golden Opportunities Fund,” a fund that takes investment positions based on the level of inflation. The key tool in their investment decisions is the “Incrementum Inflation Signal” (also referred to as the “monetary seismograph”), a continuing measurement of how much monetary inflation reaches the real economy based on a series of market-based indicators. The Incrementum Inflation Signal started showing rising inflationary momentum after a period of 19 month of disinflation. Is Inflation making a comeback just as the consensus worries about deflation risk? That was the subject of Incrementum’s first Advisory Board in which much respected names have a seat, including James Rickards, Heinz Blasnik, Rahim Taghizadegan, and Zac Bharucha. The Board was led by Ronald Stoeferle, managing director of Incrementum Liechtenstein, and its partner, Mark Valek. This article summarizes Incrementum’s Advisory Board meeting. The full transcript is at the bottom of this article. The interesting thing about this breakup in commodities is that “nobody” is talking about it. This seems very reminiscent of the commodities rally that started in 2000-2002. Related to these inflationary signals, the usefulness of the CPI as a decision making tool is highly questionable. Ronald Stoeferle compares today’s situation with the 70ies when Paul Volcker had the mandate to kill inflation, which is in contrast to today’s central planners who are desperate to create inflation. Their comfort zone is the official CPI inflation rate between 1.5% – 2.5%. They will do whatever it takes to create this inflation. CPI statistics are not used in Incrementum’s Inflation Signal; the inflation data are market based indicators. The usefulness of the CPI is highly questionable because it cannot measure anything. Central bankers, however, care about it. They would be willing to keep an even higher CPI of 2%. Incrementum’s Advisory Board sees a lot of strength in the current gold price action. In addition, Zac Bharucha points to the recent “independence” in gold. “It has been a sort of risk on, risk off trade. A lot of people have bought gold a couple of years ago because of an Armageddon scenario. And the Fed has postponed Armageddon for now. So a lot of gold got liquidated, and there was great temptation to pile into the rallying stock market. But now you are getting gold at a big discount from where it was selling 3 years ago.” Some people could be looking at gold’s $700 decline from its highs and consider it as a (cheap) insurance. The problem for gold, however, is the opportunity cost with all kinds of other assets which are more a beneficiary of this inflationary politics. It could be the main reason of falling gold prices. It even looks like as if the inflationary politics had a deflationary effect on the economy by sucking a lot of funds into financial assets and out of the real economy. Is the stock market topping? Is it in a bubble? Following indicators raise a yellow flag. The sentiment indicators in the US markets shows a very low cash in the mutual funds, just 3.3% cash, which is a historically very low level. Sentiment of advisors sits at the highest level since the 87 crash. So sentiment-wise the market looks very stretched. There is some of loss of participation in the stock markets but the breadth is still good in the US. Even if the market is turning, US leading stocks will still continue to outperform. With the prospects of extremely low real interest rates in the foreseeable future, there are almost no profitable alternatives next to stocks, given the explosion in house prices and sky high bond prices. That is exactly what the Fed is aiming for. They want investors to go to long duration assets. The advance since the 2009 low looks exactly like the bubble model from Sornette. The volatility declines more as the stock market goes higher. These are typical bubble characteristics. 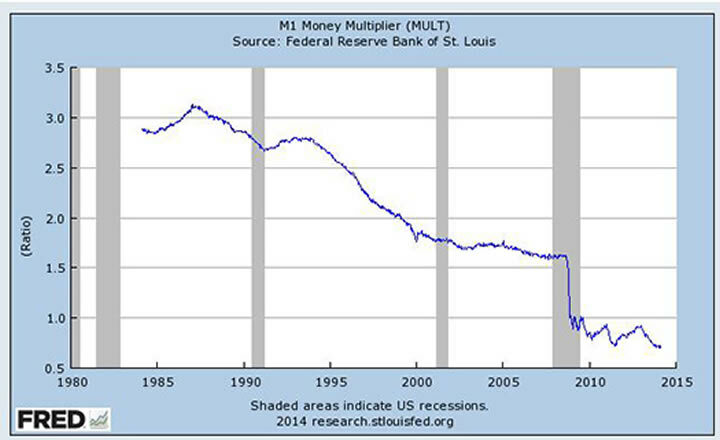 At the same time, velocity is going down as quickly as money supply is going up. So the question is not: “When does the money supply grow but rather when does velocity pick up?” When the velocity curve turns – that is the point when inflation comes in very rapidly. The problem is that this is a psychological threshold not a monetary threshold. When velocity turns, it means nominal GDP is beginning to rise, and that probably means prices for other goods are starting to go up. In closing, there is an important point to be made about Crimea’s potential impact to the financial and monetary system. Rickards sees another nail in the coffin of the role of the US dollar as a reserve currency. One should consider the following. President Obama has more or less anointed Iran as the regional hegemon in the Middle East. This is a stab in the back to Saudi Arabia which for several decades has supported the dollar by insisting that oil has to be priced in dollars. The quid pro quo is that the US would in fact insure the national security of Saudi Arabia. By backing Iran, the US has undermined the national security of Saudi Arabia and therefore Saudi Arabia has less reason to support the dollar. At the same time, the US is about to impose financial sanctions to Russia. The Russians have reacted by saying they would not pay their dollar loans, and begin to dump US Treasury bills. We already know what China is doing with gold. Saudi Arabia has less reason to hold dollars because of Iran. Russia has less reason to support the dollar because of the Ukraine. This is financial warfare on a scale never seen before. Putting all this together, a large part of the world is working very hard to get out of the dollar system. That is going to be bad for the dollar, and it is going to be good for gold.